The Bust-A-Move Bot was first seen during the Monday of the Year of the Dragon. 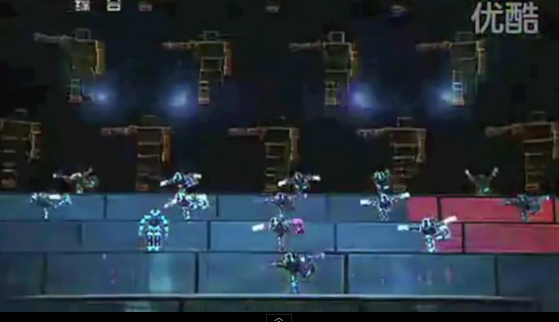 This group of fourteen robots took the stage, dancing to a catchy remix of the Russian song "Korobuskka". The show consisted of a mix of musics, lights and of course, the robots. 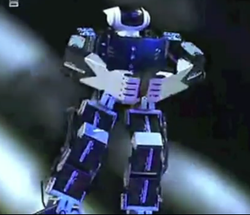 The robot's dance moves are shown to be pretty complex as they are able to do a variety of moves in nearly perfect unison with eachother. I believe that this invention could be fascinating at first, but I'm not sure how long that would last. I would be intrigued to go to something that was advertised as a "Robot Concert", as I'm sure many others would as well. This would come across as a big hit and success. Although I'm thinking that over time, this type of show/concert could get really boring. It's in my understanding that although these robots are able to do a variety of dance moves, they still can only do so much. These shows could become boring as they would be doing the same thing over and over again. I am sure that this could be fixed, but this I could only imagine would be very time consuming. I would think that to make these robots to what is shown, is through some kind of programming system. These programs, I am sure, are very complex to be able to do all of these moves. To create, change and program all fourteen robot dance members could take a long time. Even at that, I'm not sure how interesting you could make this "new" show even if the movements are changed. The show would have to be completely different which would mean different and more creative choreography. Which again, requires more time and even more difficult programming. For these specified reasons, I'm not sure how successfull these Bust-A-Move robots could become. Although they seem interesting at first, I'm not sure how long this interest would last. As stated prior, to keep the interest would mean taking a lot of time and effort which would become very time consuming and possibly not worth the time and effort for what could be little outcome.